Figure 1. Global Prevalence of Type 2 Diabetes in 2000 and estimated prevalence in 2030. Type 2 diabetes develops when the body becomes insulin resistant or when the pancreas stops producing enough insulin. The exact cause is unknown, however excess body weight and inactivity are contributing factors. Refer to the following table for major risk factors associated with Type 2 diabetes. In order to be diagnosed with Type 2 Diabetes, an individual must present with all of the following: 1) Classic symptoms of diabetes mellitus, including polyuria, polydipsia, polyphagia, weight loss, and random plasma glucose ≥ 200 mg/dL, 2) Fasting plasma glucose ≥126 mg/dL, and 3) Two hour post glucose load (75g) plasma glucose ≥200 mg/dL, and confirmed by repeat test. The individual with Type 2 Diabetes typically goes undiagnosed for years because the onset is gradual and signs of hyperglycemia is not noticed. Individuals commonly experience visual blurring, neuropathic complications, infections, fatigue and significant blood lipid abnormalities. Type 2 Diabetes is typically diagnosed when the patient is receiving medical care for another problem. The patient often presents with a long-term complication of type 2 diabetes, such as cardiovascular disease (CVD), neuropathy, retinopathy, or nephropathy. Cardinal signs and symptoms of type 2 diabetes include: 1) atherosclerosis, 2) CVD, 3) retinopathy, 4) nephropathy and end-stage renal disease (ESRD), 5) increased risk of infection, 6) musculoskeletal complications of the hands, shoulders, spine, and feet, and 7) sensory, motor, and autonomic neuropathy. Figure 2. Characteristic symptoms of type 2 diabetes. The long-term presence of type 2 diabetes impacts the large and small blood vessels and nerves throughout the body. Chronic hyperglycemia can lead to macrovascular disease, which affects the arteries supplying the heart, brain, and lower extremities. Type 2 diabetes is also associated with the development of microvascular pathologies in the retina, renal glomerulus, and peripheral nerves. Hyperglycemia associated with diabetes can cause abnormalities in blood flow and increased vascular permeability. Carbohydrates are a main form of energy consumed and utilized by the body. They enter the body in the form of food and are broken down into the molecule glucose by the digestive system. For more on the digestive system refer to here. Glucose enters the bloodstream after digestion and may be used immediately by various tissues or stored for later use as glycogen (See Carbohydrate Storage: Glycogen), depending on metabolic demands. When glucose levels rise in the bloodstream, the pancreas secretes insulin into the blood. In normal healthy tissues, insulin then enables glucose to enter cells through the insulin signaling pathway (see next section for more information). Once inside the cell, glucose is converted into energy (ATP) by three processes: Glycolysis, the Citric Acid Cycle, and the Electron Transport Chain, resulting in a total of 36 ATP units. For more information on Carbohydrate Metabolism and ATP, click here. The insulin signaling pathway refers to the complex biological process of insulin reacting with target cells such as muscle, fat, or liver cells and the resulting intracellular effects that result, leading to various functional effects observed at the multicellular level. Insulin is a hormone that is well-known for regulating glucose within the bloodstream. It also has been shown to mediate lipid and protein metabolism, transcription of specific genes, cell growth and differentiation. The hormone is produced endogenously by Beta Islet cells in the pancreas and is typically released into the bloodstream after consuming carbohydrates (sugar). ***For information on glycogen synthesis (glycogenesis), glycogenolysis, and glyconeogenesis, see Carbohydrate Storage: Glycogen. Insulin works by binding its specific receptor on cell surfaces throughout the body, such as on liver, muscle or adipose cells. The insulin receptor is a tyrosine kinase protein that undergoes autophosphorylation of its tyrosine residues that located on its cytoplasmic face once activated by insulin. This in turn phosphorylates a panel of substrates such as insulin receptor substrates (IRS) 1 and 2 and Shc that play an important role in the subsequent cascade of intracellular events described below. There are two main subpathways in insulin signaling pathway: PI3k and MAPK. The phosphorylated IRS proteins activate PI 3-kinase (pI3k) and its downstream targets such as PKB, mTOR, p70 S6 kinase and atypical PKCs. One of the earliest steps in the insulin signaling pathway is PI 3-kinase (PI3k) activation. It plays a major role in many insulin regulated responses including stimulation of glucose uptake via Glut4 translocation, glycogen synthesis by inhibiting CSK-3 phosphorylation, synthesis of growth-specific proteins, cell growth and proliferation. Protein kinase B (PKB) is a cellular homologue to the transforming oncogene v-Akt. The activation of PI3k is necessary for the activation of PKB. PKB activation involves an interaction with PI(3,4,5)P3 and/or PI(3,4)P2 through the PH domain. Through PKB’s isoforms α, β, and γ, it plays role in mediating glycogen synthase kinase-3, metabolic actions of insulin, and Glut4 translocation. It is debated whether PKB plays a significant role in insulin resistance with diabetes. Some studies have observed alterations in phosphorylation or enzymatic activity of PKB when comparing type 2 diabetic patients to controls while others have not. The p70 ribosomal S6 kinase (p70 S6k) is a serine/threonine kinase. Mounting evidence has shown that PI3k and PKB activation participate in the stimulation of p70 S6k. Other substrates that promote p70 S6k are PDK1 and mTOR. PI3k also contributes to the activation of the atypical PKC enzymes PKCζ and PKCλ. These activations are independent of the PI3k’s cascade branch involving PKB, PDK1, mTOR, and p70 S6k (see figure below). 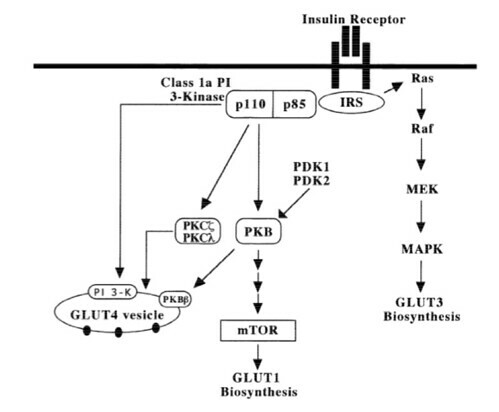 In total, the activation of the PI3K subpathway mediates several insulin-induced responses including GLUT4 activation, glycogen synthesis by inhibiting CSK-3 phosphorylation, and lipogenesis by up-regulation of fatty-acid synthase gene expression. MAPK is other main subpathway that is activated after IRS-1 and 2 phosphorylation that begins with small adaptor proteins Grb2 and SHP2 that lead to further substrate activation downstream. These proteins activate Ras, which recruits serine/threonine kinase Raf to the plasma membrane by direct interaction with its effector region. Raf phosphorylates MEK, a dual-specificity kinase of tyrosine and threonine that activates mitogen-activated protein kinase (MAPK). The MAPK pathway is well known within the insulin signaling cascade, but is not very sensitive to insulin or involved in most of the hormone’s important metabolic responses. 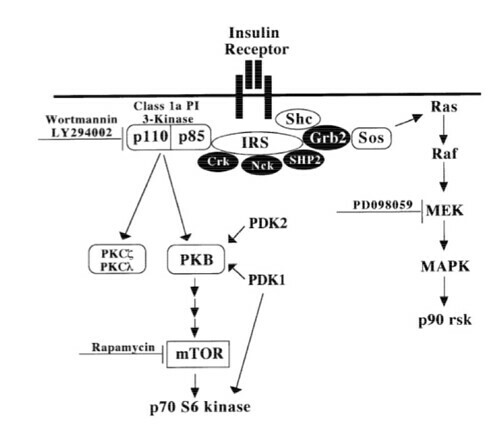 The MAPK subpathway has some evidence showing it functions to exert feedback regulation on the PI3k subpathway and is involved in the process of insulin resistance. Figure 4. The PI3K subpathway substrate sequence: IRS proteins (IRS-1,2 and Shc) -> PI3K ->PKB -> p70 S6K. This subpathway also has a second branch: PI3K -> PKCζ and PKCλ. The PI3k subpathway functions to mediate glut4 activation, glycogen synthesis, and lipogenesis. The MAPK subpathway substrate sequence: IRS-1,2 -> Grb2 and SHP2 -> Ras -> Raf ->MEK -> MAPK -> p90rsk. The MAPK subpathway may serve to regulate the PI3k subpathway and may be involved in insulin resistance, but more research is needed to prove this. Insulin-mediated Glucose transport is primarily accounted for through the translocation of glucose transporters to the plasma membrane, most of which is GLUT4 within muscle and adipose cells. Insulin increases the transporters’ cycle to and from the cell surface by promoting exocytosis and inhibiting endocytosis. It has been shown that tyrosine kinase activity and IRS-1-protein phosphorylation are two essential processes in normal glucose transport. Within these pathways, PI3k, PKB, and the atypical PKCs play an particularly key roles in the process of glucose uptake into cells. In contrast, the downstream constituents of PKB such as p70 S6k have been shown to have no immediate effects on glucose uptake. mTOR/p70 S6k may however be implicated in some longterm effects of insulin such as synthesis of Glut1 in specific cells. The MAPK pathway is not likely to be involved in most cases of rapid glucose transport based on the work of Haussdorff et al and Fingar et al. For more on Glut4, see the GLUT4 section below. Figure 5. The PI3K pathway (key substrates- PI3k, PKB and atypical PKCs) mediates Glut4 activation. The mTOR pathway mediates Glut1 activation. The MAPK pathway mediates Glut3 activation. Most of glucose that enters human muscle in response to insulin is desposited as Glycogen (see Carbohydrate Storage: Glycogen for more information). Insulin causes stable Glycogen Synthase (GS) activation by causing dephosphorylation at multiple sites within the enzyme. There is still much debate on the exact pathways for GS activation. The PI3k pathway has been implicated as two modes of GS promotion. PKB activates the mTOR/p70 S6k cascade, which is thought to directly promote GS in specific cells. PKB has also been shown to directly inhibit GSK-3, a well-known inhibitor of GS, thereby promoting GS. MAPK has been implicated in activating GS through phosphorylation of p90 Ribosomal S6 kinase 2 (p90 rsk2) and glycogen bound protein phosphatase-1 (PP1G) downstream. PP1G has many phosphorylation sites that insulin has been shown to augment, but its exact role in GS promotion is not fully understood. Figure 6. PI3k subpathway has two main branches that promote GS production: PI3K -> PKB -> mTOR/p70 S6k (? )-> GS and PI3K -> PKB -| GSK-3 -| GS. The former branch is implicated in direct promotion of GS although the specific relationship between mTOR/p70 S6K and GS are not clear. The later branch is implicated GS promotion by inhibition of the well-established inhibitor of GS, GSK-3. The MAPK pathway is also implicated in GS production: Ras -> Raf -> MEK -> MAPK -> p90 rsk2 -> PP1G (? )-> GS although the relationship of the endstream substrates p90 rsk2/PP1G and GS is not clear, like mTOR/p70 S6K. Through these three subpathways, the insulin signaling pathway promotes GS and glycogen synthesis. Carbohydrates are stored as glycogen in humans through a process called glycogenesis. Glycogen is a polymer of glucose, containing up to 120,000 glucose units. Glycogen is primarily stored in the liver and muscles. Once glucose enters liver or muscle cells, it is converted to glucose-6-phosphate (G6P) by local hexokinase or glucokinase enzymes. G6P is converted into glucose-1-phosphate (G1P) by enzyme phosphoglutomutase. G1P and uridine-5'-triphosphate (UTP) is synthesized into to UDP-glucose by enzyme G1P-uridyltransferase. The gycogen synthase enzyme completes glycogenesis by removing glucose from UDP-glucose and depositing it onto existing glycogen stores. The conversion process from glucose to glycogen: Glucose (1)-> G6P (2)-> G1P (3)-> UDP-glucose (4)-> added to existing glycogen stores. Enzymes responsible for glycogenesis 1 through 4 respectively: Hexokinase/Glucokinase, Phosphoglutomutase, G1P-Uridyltransferase, and Glycogen Synthase. Glycogenolysis is the process of breaking down glycogen for energy use when blood glucose levels are low and carbohydrates are not available by consumption. Glycogenolysis is stimulated by Glucagon, a hormone created within the Alpha Islet Cells of the pancreas. Whereas Insulin facilitating uptake to lower its blood glucose, Glucagon stimulates the breakdown of carbohydrate stores to increase blood glucose. 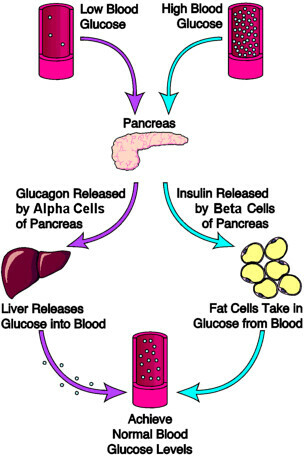 See figure below for diagram of pancreas secretion of Glucagon and Insulin working together to regulate blood glucose. The biochemical process of glycolysis reverses many of the steps of Glycogenesis with different enzymes. Glycogen links are converted to G1P by Glycogen phosphorylase. G1P is converted to G6P by Phosphoglutomutase. G6P is then converted to glucose by Glucose-6 Phosphotase (in the liver). Conversion from glucose is not always a necessary step as many tissues can utilize locally generated G6P for energy processes. Figure 8. The conversion process from glycogen to glucose (in the liver): Glycogen (1)-> G1P (2)-> G6P (3)-> Glucose. Ezymes responsible for Glycogenolysis 1 through 3 respectively: Glycogen phosphorylase, Phosphoglutomutase, Phosphoglutomutase, and Glucose-6 Phosphotase. Gluconeogenesis is an alternative process of obtaining glucose through the biochemical conversion of amino acids and trans-fatty acids from protein and fat stores. It mainly occurs in the liver and is necessary when there is not enough glucose available in the blood for tissues that require glucose exclusively as an energy source, such as the brain. For more on Glycolysis, gluconeogenesis, and glycogenolysis, click here. TNF-α is a proinflammatory cytokine that is induced in response to injury and infection. It plays a role in the mediation of the inflammatory processes in a variety of inflammatory disorders. TNF-α has been found to have an effect on insulin signaling, lipid metabolism, and adipocyte function and play a central role in various components of metabolic syndrome, including obesity-induced insulin resistance. Research indicates that TNF-α levels in adipose tissue of human subjects are positively correlated with body mass index (BMI) and hyperinsulinemia, and extended administration of TNF-α may result in hyperinsulinemia. TNF-α contributes to insulin resistance by a variety of mechanisms, including inhibition of insulin receptor signaling, inhibition of glucose transport, and regulating lipid metabolism. TNF-α offered the first piece of molecular evidence that linked obesity, inflammation, and insulin resistance. TNF-α mRNA levels have been found to be elevated in adipose tissue of obese human subjects, and may play a role in obesity-mediated insulin resistance. The Insulin Resistance Atherosclerosis Study (IRAS) investigated the relationships insulin resistance, cardiovascular risk factors, and cardiovascular disease in a multiethnic population across varying statuses of glucose tolerance. Participants demonstrated normal glucose tolerance (NGT), impaired glucose tolerance (IGT), or type 2 diabetes mellitus. Measures of insulin sensitivity and insulin secretion were obtained from all participants during two 4-hour visits, occurring approximately one week apart. Results indicated that circulating levels of TNF-α were higher in participants with type 2 diabetes and IGT compared with those with NGT, regardless of ethnicity. Correlations between TNF-α and waist circumference, fasting insulin, HDL, plasminogen activator inhibitor-1 (PAI-1, the principal inhibitor of tPA), and triglycerides were found across all participants, indicating that TNF-α is more closely associated with increased insulin resistance than with decreased insulin secretion and defects in β-cell function. Mitochondria are the major source of reactive oxygen species (ROS) production in the cell. Increased levels of ROS are a likely cause in a variety of pathophysiological conditions, including type 2 diabetes. Oxidative stress to the mitochondria can come from many sources. ROS are produced in larger amounts by islet cells from patients with type 2 diabetes than by those from non-diabetic patients. Although some ROS are produced in the peroxisomes, the major source of ROS production in cells is the mitochondria. Evidence suggests that obesity and hyperglycemia are associated with increased production of ROS. Mitochondrial production of ROS may also be involved in determining skeletal muscle insulin sensitivity. Research on cultured cells suggests that ROS may have an inhibitory effect on insulin signaling. If ROS are not immediately eliminated from the mitochondria, they can cause damage to the mitochondria by promoting DNA fragmentation, protein cross-linking, peroxidation (oxidative degradation of lipids) of membrane phospholipids, and activation of a series of stress pathways. Therefore, in islets in patients with type 2 diabetes, β-cell mitochondria have been found to exhibit morphological abnormalities such as hypertrophy, a rounded shape, and higher density compared to β-cell mitochondria in control subjects. Research indicates that increased ROS levels are associated with altered mitochondrial morphology in both myotubes cultured in high glucose conditions and in diet-induced diabetic mice. In addition, increased oxidative stress in mitochondria may contribute to increased lipid peroxidation and damage to cell membranes and DNA. This, in turn, activates a cascade of events that further aggravates the severity of the type 2 diabetes. Figure 9. 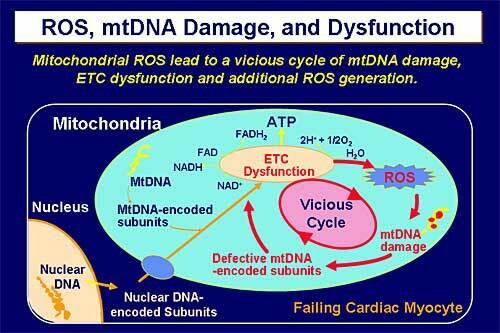 Mitochondrial ROS leads to a vicious cycle of damage. Apoptosis is a genetically directed process of cell self-destruction marked by the fragmentation of nuclear DNA. It is a form of cell death during which a programmed sequence of events leads to the elimination of cells without releasing harmful substances into the surrounding area. Apoptosis plays a role in developing and maintaining health by eliminating old, unnecessary, and damaged cells. Reductions in β-cell mass and function both contribute to the pathogenesis of β-cell failure in type 2 diabetes. The islets of individuals with type 2 diabetes have significantly reduced β-cell volume. In addition, the decreased β-cell volume found in subjects with fasting hyperglycemia is associated with increased β-cell death by apoptosis. The onset of type 2 diabetes is accompanied by a progressive decline in β-cell mass due to a significant increase in β-cell apoptosis. Mitochondria play a fundamental role in regulating apoptotic cell death. During apoptosis, pro-apoptotic stimuli induce the release of cytochrome c from the mitochondria into the cytoplasm. Cytochrome c then participates in the formation of apoptosomes (proteins formed during apoptosis), which activate caspase-9. Caspase-9, the initiator caspase, then activates the executioner caspaces 3,6, and 7, which dismantle the cell during apoptosis. Figure 10. The process of apoptosis and its relation to the mitochondria. Evidence suggests that the release of cytochrome c from the mitochondria results from direct action of ROS on cardiolipin, a mitochondrial phospholipid which is located in the inner mitochondrial membrane. During the early phase of apoptosis, mitochondrial ROS production is stimulated and cardiolipin is oxidized (loses electrons). This causes cytochrome c to detach from the mitochondrial membrane and be released into the cytoplasm of the cell. Cardiolipin is a target of the proapoptotic protein tBid, which is a member of the Bcl-2 family produced from Bid by the activation of caspase-8. This then results in the activation of the mitochondrial death pathway once apoptosis is induced via engagement of death receptors. Cardiolipin is the mitochondrial target of tBid, which then promotes the formation of pores in the outer mitochondrial membrane by Bax or Bak. The process of pore formation is inhibited by Bcl-2 or Bcl-XL. Cardiolipin is a central participant in regulating apoptosis and alterations of mitochondrial cardiolipin have been recognized as being involved in the development of type 2 diabetes and other pathological conditions. Specifically within renal cells, increased apoptosis due to hyperglycemia is shown to be associated with end stage renal failure in type 2 diabetics. 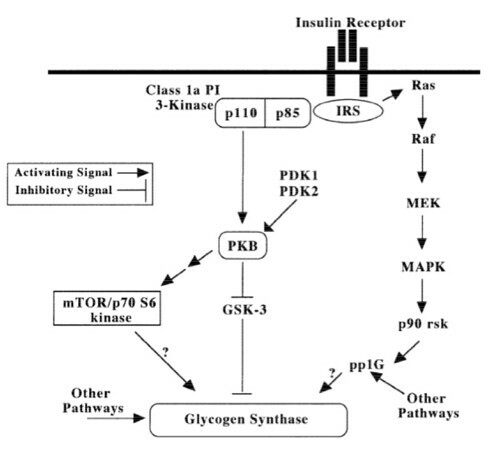 Hyperglycemia has been shown to downregulate Akt substrate activation within the PI3K subpathway and corresponding increase in p38 MAPK activity of the insulin signaling pathway. Akt is a serine/threonine kinase that regulates a number of cellular functions such as glucose metabolism, glycogen synthesis, protein synthesis, cell proliferation, cell hypertrophy, and cell death. p38 is a protein substrate of the MAPK subpathway which has implications in insulin resistance and influences of PI3K subpathway when significantly altered. The changes in Akt activation coincides with a significant increase in ROS generation within the mitochondria, leading to increase apoptosis of renal cells of the kidney. For more on the PI3k and MAPK subpathways, see the Insulin Signaling Pathway above. HbA1c testing provides clinicians and patients with type 2 diabetes an objective measurement average glycemic control over time. The ADA recommends that HbA1c testing be performed twice a year in diabetic patients with stable glucose control, and once every three months in diabetic patients who are failing to meet their treatment goals. This information can be used to set patient goals to reduce the risks associated with chronic hyperglycemia. It can also provide information about the efficacy of interventions in patients managing type 2 diabetes. A recently published review of related studies clearly shows that patients with type 2 diabetes can reduce HbA1c levels and the associated risk of cardiovascular disease via numerous therapy options. Therapy options found to reduce HbA1c levels include lifestyle modification (diet and exercise) and numerous antidiabetic drugs. A portion of the metabolic stress seen in Type 2 Diabetes may originate from myocellular fat storage. In muscle tissue, lipids are stored as either extramyocellular lipids (EMCL) or intramyocellular lipids (IMCL). EMCL is metabolically static, but IMCL stores are built up, mobilized, and used within hours. Research has found a strong negative correlation between accumulation of IMCL and insulin sensitivity (IS) in humans, both those with and without diabetes, glucose-tolerant and –intolerant, and in individuals with or without obesity. The combination of increased IMCL and low oxidative capacity are key features in the development of muscular insulin resistance, which is one of the earliest signs of Type 2 Diabetes. High IMCL levels combined with compromised mitochondrial function may play a role in reduced insulin sensitivity. Research has found that IMCL content correlates negatively with insulin sensitivity; therefore, IMCL is a marker for insulin resistance. A four month study investigating the relationship between insulin sensitivity (IS) and IMCL content in Zucker diabetic fatty rats (ZDF) confirmed the relationship between IS and IMCL content seen in humans. The study monitored the IMCL levels in lean and obese ZDF male rats (at 6, 8, 10, 14, 18, and 22 weeks), and detected IMCL concentrations were significantly increased in the obese ZDF rats compared to their lean counterparts. Figure 11. An obese Zucker diabetic fatty rat has significantly higher IMCL concentrations than its lean counterpart. *AMPK is activated resulting in increased ATP production or inhibited resulting in ATP dephosphorylation to ADP in order to balance nutrient supply with energy demand. It is composed of 3 different subunits α, β, and γ appearing in several isoforms (different forms of the same protein) with similar functions. The α-subunit contains the catalyst site that helps to speed up the activation of AMPK through binding with protein kinases (seen in figure 12). The regulatory β- and γ-subunits are important to maintain the stability of the complex. The β-subunit contains the region that allows AMPK to bind to glycogen. The γ-subunit binds two molecules of AMP or ATP. This binding of AMP activates AMPK through direct activation and phosphorylation of the α-subunit. *Activation of AMPK causes increased GLUT4 activation resulting in increased glucose uptake from the blood into the cell. AMPK is activated by physical activity in such a way that increased intensity results in increased activation. It is known that increased muscle contraction results in increased energy/ATP demand, which results in increased activation of AMPK. As physical activity intensity increases, ATP demand increases as well, causing increased activation of the AMPK pathway. It has been shown that AMPK directly phosphorylates and activates PGC-1 α. We know that PGC-1 α activity is decreased in type 2 diabetes, and therefore activation of AMPK could be used to increase PGC-1 α activity in patients with type 2 diabetes. Increased activation of PGC-1 α leads to an increase in mitochondrial biogenesis, which improves metabolism of carbohydrates, fats and proteins. Research shows that AMPK activation may enhance the effects of exercise on insulin sensitivity and glucose transports in skeletal muscle as well as additional metabolic benefits in the liver. Disruption of AMPK activation has been shown to be a key factor in metabolic disorders, including type 2 diabetes. PGC-1α (Peroxisome Proliferator-Activated Receptor (PPAR)- gamma coactivator (PGC)-1 alpha) is a protein transcription coactivator that assists by coactivating many transcription factor involved in many aspects of cellular functions. 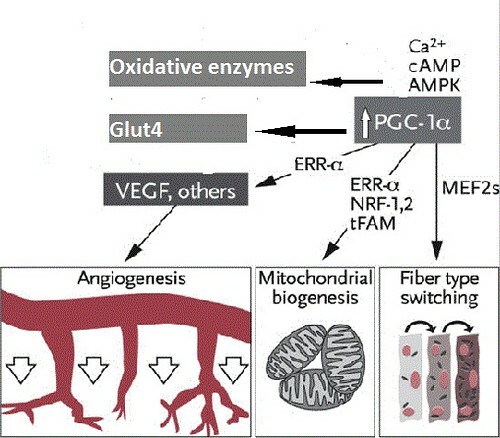 Of the many cellular functions PGC-1α helps with is metabolism of multiple energy substrates. In mice with over expressed PGC-1α there was an enhanced mRNA content of fat oxidation enzymes like carnitine almitoyltransferase I and medium-chain acyl-coenzyme A dehydrogenase, whereas PGC-1α knockout mice has a decrease in these fat oxidation enzymes. PGC-1α assists with glucose metabolism, by increasing the amount of Glut4 which allows glucose transport in to the cell. Gluconeogenisis is assisted by PGC-1α which has been shown that mice with over expressed PGC-1α had improve glycogen utilization during endurance exercise compared to knockout mice. Multiple changes in skeletal muscle have been associated with PGC-1α such as conversion of type IIb (glycolytic) muscle fibers to type IIa and type I (oxidative) muslce fibers. The fiber type change in the skeletal muscle changes the substrate utilization to an increase in oxidative fatty acid metabolism. Angiogenesis has also been found in mice with over expressed PGC-1α, these mice have an increase in vascular endothelial growth factor (VEGF) and an increase capillary density compared to knockout mice. The fiber type conversion and angiogenisis is functionally supported in over expressed PGC-1α mice who have increased running endurance and VO2 max compared to knockout mice. PGC-1α promotes mitochondrial biogenesis and has been linked with increased mitochondrial transcription factor (tFAM) and nuclear respiratory factor (NRF1, NRF 2). Skeletal muscle of over expressed mice showed a change in color and increase mRNA in lab testing compared to knockout mice. Studies have shown PGC-1α to have a decrease in mRNA and reduced protein content of mitochondrial respiratory chain proteins and ATP synthase. This change in mitochondrial respiratory chain proteins and ATP synthase also assists in the defense against anti-oxidants. With increased oxidative capacity of mitochondrial there is better control of reactive oxygen species (ROS). In human studies with people with type 2 diabeties have a decreased PGC-1α expression compared to healthy subjects. The skeletal muscle of people with type 2 diabetes and their asymptomatic relatives have a decrese in mRNA expression for PGC-1α. GLUT4 is a glucose transporter protein found mostly within muscle and fat cells. Glucose transporters facilitate delivery of glucose from the bloodstream to various bodily tissues and thus are important in regulating blood glucose homeostasis. Within skeletal muscle and adipose tissue, GLUT4 is the predominant glucose transporter. For muscle, both insulin and muscle contraction can activate GLUT4 by translocating it from intracellular sites such to the plasma membrane where it can actively deliver glucose into the cell. There is evidence suggesting that exercise and insulin stimulate different stores of GLUT4 within muscle cells and thus have additive effects when working together to translocate the transporter. Figure 15. Insulin-induced Glut4 translocation: occurs via the PI3K subpathway. Exercise-induced Glut4 translocation: occurs via mechanical contraction and calcium presence from the sarcoplasmic reticulum, although these pathways are less understood than insulin-induced translocation. Diet - The use of a balanced diet consisting of primarily non-starch whole grain carbohydrates high in fiber and low in saturated fats can help control slightly elevated blood glucose. An increase in overall fat intake and excess adipose tissue decreases insulin binding, glucose transportation, and reduced glycogen synthesis. Saturated fat increase has been linked to higher fasting insulin levels and decreased insulin sensitivity, where as non-saturated vegetable fats have had an opposite effect. A positive correlation has been seen with an increase in BMI (greater than 18.5-24.9 kg/m2) and waist to hip ratio and Type 2 Diabetes in various epidemiological studies. An increase in carbohydrates with high glycemic index scores and low in dietary fiber have an increase risk for diabetes and decrease insulin sensitivity. A variety of studies have shown improve glycemic control and decreased LDL with diets high in carbohydrates and low in fat compared to diets high in fat and low in carbohydrates. The American College of Sports Medicine (ACSM) recommends 150 minutes of exercise per week to help manage blood glucose levels. For more information, visit the Type 2 Diabetes Exercise page. Metformin- A medication which lowers blood glucose levels by suppressing hepatic gluconeogenesis, increases glucose utilization in the periphery, and increases insulin sensitivity. Metformin is contraindicated in patients with renal impairments or vascular disease. Thiazolidinediones – A medication which increases receptor molecules, specifically peroxisome proliferator-activated receptors. These molecules help the transcription of genes for fat and glucose metabolism. Adverse effects include increased edema and congestive heart failure. Dipeptidyl peptidase-4 inhibitors - A medication which reduces blood glucose by blocking DPP-4, which reduces glucagon production and increases insulin secretion. Side effects include slowed gastric emptying. α-glucosidase inhibitors – A medication which reduces postprandial blood glucose by reducing the amount of glucose digested through competitive inhibition of enzymes for carbohydrate digestion in the intestines. This is contraindicated in gastrointestinal disease or severe renal and hepatic disease. Sulfonylureas – A drug class that stimulates insulin secretion in a glucose-dependent manner. Side effects include hypoglycemia; therefore, the patient must be monitored. Repaglinide – A drug class administered prior to eating that stimulates insulin secretion with a shorter half life compared to sulfonylureases. A systematic review of oral medication found that most guidelines for oral medications support metformin as a top tier hypogylcemic drug with minimal adverse conditions compared to other oral medications. When the pancreas can no longer maintain optimal blood glucose levels with using the various oral medications, many doctors will add insulin injections to assist in controlling glucose levels. Normally insulin is injected in to adipose tissue of the abdomen or pumped in to the abdomen tissue through a pump. A variety of types of insulin are used based on the onset time for insulin to reach the blood stream, peak time for the insulin to reach maximum strength, and the duration of time required for insulin to lower blood glucose. Insulin therapy normally begins with one injection per day plus the use of oral medication. When blood glucose is no longer controlled with one injection, multiple injections may be added. Metformin and insulin in combination had better control over glucose levels than insulin alone. Sulphonylurea and insulin had similar or better control in combination compared to insulin alone. Type 2 diabetes is a chronic, systemic, metabolic disorder distinguished by hyperglycemia, insulin resistance, and insulin deficiency. Type 2 diabetes develops when the pancreas does not produce enough insulin (insulin deficiency) or cells in the body fail to respond to insulin (insulin resistance). When insulin fails to enable glucose transport into cells, glucose may excessively accumulate in the blood (hyperglycemia). Collectively, this decreases the body’s ability to control glucose levels and utilize glucose to adequately fuel cells in the body. Uncontrolled chronic hyperglycemia can lead to diabetic complications such as cardiovascular disease, retinopathy, neuropathy, nephropathy, recurring infections, and musculoskeletal disorders of the spine, shoulders, and distal extremities. However, onset is gradual and clinical signs are often unnoticed in early development. The exact cause of type 2 diabetes remains unknown. However, obesity and sedentary lifestyle are highly associated with development of the disease. On the cellular level, evidence is mounting relating to the insulin signaling pathway, its associated substrates, and their roles in insulin resistance with diabetes. 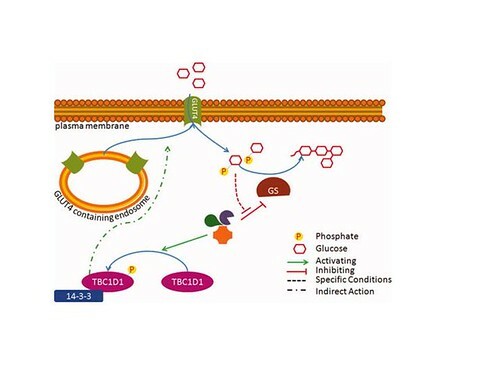 Activation of the PI3k and MAPK subpathways promote glucose transport and production of glucose synthase. Alterations in these signaling pathways may account for decreased insulin function with type 2 diabetes. Mitochondrial dysfunction also appears to be an important factor related to interruption of the insulin signaling pathway and alterations in cellular apoptosis. Both human and animal studies have demonstrated an association between compromised mitochondrial health and type 2 diabetes.,,, Research has also shown additional cellular structures to have associations with the disease; including HbA1c, TNF-α, IMCL, AMPK, PCC-1α, and Glut4. Each of these has been used as a biological marker of interest in previous literature. For example, treatment aimed at increasing expression PCC-1α may be of particular importance with type 2 diabetes due to its ability to promote glucose metabolism and mitochondrial biogenesis., However, the exact cellular mechanisms attributable to type 2 diabetes remain unclear. Further research is warranted to better understand the underlying cellular processes of the disease and determine what interventions are best suited to manage it. 1. Diabetes mellitus type 2. Wikipedia, The free encyclopedia Web site. http://en.wikipedia.org/wiki/Diabetes_mellitus_type_2. Updated 2012. Accessed January 19, 2012. 2. Goodman C, Fuller K. Diabetes mellitus. Pathology implications for the physical therapist. 3rd ed. St. Louis, Missouri: Saunders Elsevier; 2009:488-497,1641-43. 3. National diabetes fact sheet: National estimates and general information on diabetes and prediabetes in the united states, 2011. http://diabetes.niddk.nih.gov/DM/PUBS/statistics/#fast. Updated 2011. Accessed January 19, 2012. 4. William D. McArdle, Frank I. Katch, Victor L. Katch. Exercise physiology: energy, nutrition, and human performance Sixth Ed. Lippincott Williams & Wilkins. 2006. 5. Saltiel A and Pessin J. Insulin signaling pathways in time and space. TRENDS in Cell Biology. 2002; 12(2): 65-71.
the important roles of insulin and glucagon: Diabetes and hypoglycemia. http://www.endocrineweb.com/conditions/diabetes/normal-regulation-blood-glucose. Updated 2011. Accessed January 20, 2012. 7. Pirola L, et al. Modulation of insulin action. Diabetologia. 2004; 47:170-184. 8. Taha C and Klip A. The Insulin Signaling Pathway. J Membrane Biol. 1999; 169: 1-12. 9. Dimitriadis G, et al. Insulin effects in muscle and adipose tissue. Diabetes Research and Clinical Practice. 2011;93: 52-59. 10. Ahern, K. General Biochemistry: Glycogen Metabolism. Available at: http://oregonstate.edu/instruction/bb450/summer09/lecture/glycogennotes.html. Accessed on January, 2012. 12. Mayo Clinic. Type 2 diabetes: Causes. 2012. http://www.mayoclinic.com/health/type-2-diabetes/DS00585/DSECTION=causes. 13. Meex RC, Schrauwen-Hinderling VB, Moonen-Kornips E, Schaart G, Mensink M, Phielix E, et al. Restoration of muscle mitochondria function and metabolic flexibility in type 2 diabetes by exercise training is paralleled by increased myocellular fat storage and improved insulin sensitivity. Diabetes. 2010; 59:572-580. 14. Khordori R. Type II diabetes mellitus. American Diabetes Association. 2012. http://emedicine.medscape.com/article/117853-overview. 15. Kuhlmann J, Neumann-Haefelin C, Belz U, Kalisch J, Juretschke HP, Stein M, et al. A longitudinal in vivo 1H-spectroscopic study in Zucker diabetic fatty rats. Diabetes. 2003; 52:138-144. 17. Ma ZM, Zhao Z, Turk J. Mitochondrial dysfunction and B-cell failure in type 2 diabetes mellitus. Exp Diabetes Res. 2012. 19. Lira V, Benton C, Yan Z, Bonen A. PGC-1α regulation by exercise training and its influences on muslce function and insulin sensitivity. Am J physiol Endocrinol Metab. 2010;299:145-161. 21. Hemoglobin A1c. Diabetes Mellitus, Type 2 Diabetes, Type 1, and Metabolic Disorders Treatment and Medications. MedcineNet.com. Available at: http://www.medicinenet.com/script/main/art.asp?articlekey=17048. Accessed on January 20, 2012. 22. 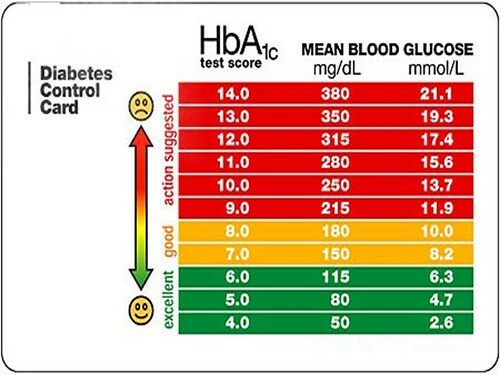 Mittal P. HbA1c: The reliable diabetes monitoring parameter. Embree Diagnostics web site. Available at: http://www.embeediagnostics.com/features/hba1c.htm. Accessed on January 20, 2012. 23. Sultanpur CM, Kumar DK, Kumar SV. Comprehensive review on HbA1c in diagnosis of diabetes mellitus. International Journal of Pharmaceutical Sciences Review and Research. 2010;3(2):119-122. 24. Gallagher EJ, Bloomgarden ZT, Le Roith D. Review of hemoglobin A1c in the management of diabetes. Journal of Diabetes. 2009;1:9-17. 25. American Diabetes Association. Position statement: diagnosis and classification of diabetes mellitus. Diabetes Care. 2010;33(S1):S62-S69. 26. Selvin E, Marinopoulos S, Berkenblit G, Rami T, Brancati FL, et al. Meta-analysis : glycosylated hemoglobin and cardiovascular disease in diabetes mellitus. Annals of Internal Medicine. 2004;141:421-431. 27. World Health Organization. Use of Glycated Haemoglobin (HbA1c) in the Diagnosis of Diabetes Mellitus. Available at: http://www.who.int/diabetes/publications/report-hba1c_2011.pdf. Accessed on February 1, 2012. 28. World Health Organization. HbA1c in the diagnosis of type 2 diabetes: a systematic review. Available at: http://www.who.int/diabetes/publications/sys_rev_hba1c_web.pdf. Accessed on February 1, 2012. 29. Kurukulasuriya LR, Sowers JR. Therapies for type 2 diabetes: lowering HbA1c and associated cardiovascular risk factors. Cardiovascular Diabetology. 2010;9(45). 30. Hey-Mogensen M, Hojlund K, Vind BF, Wang L, Dela F, Beck-Nielsen H, et al. Effect of physical training on mitochondrial respiration and reactive oxygen species release in skeletal muscle in patients with obesity and type 2 diabetes. Diabetologia. 2010; 53:1976-1985. 31. Maddux BA, See W, Lawrence JC, Goldfine AL, Goldfine ID, Evans JL. Protection against oxidative stress-induced insulin resistance in rat L6 muscle cells by micromolar concentrations of alpha-lipoic acid. Diabetes. 2001; 50:404-410. 32. Evans JL, Goldfine ID, Maddux BA, Grodsky GM. Oxidative stress and stress-activated signaling pathways: A unifying hypothesis of type 2 diabetes. Endocr Rev. 2002; 23:599-622. 33. Viollet B, Fabrizio A. AMP-activated protein kinase and metabolic control. Handbook on Experimental Pharmacology. 2011:303. 34. Liang Y, et al. Exercise-induced galanin release facilitated GLUT4 translocation in adipocytes of type 2 diabetic rats. Pharmacology, Biochemistry, and Behavior. 2012; 100: 554-559. 35. Dombrowski L and Marette A. Marked depletion of GLUT4 glucose transporters in tranverse tubules of skeletal muscle from steptozotocin-induced diabetic rats. FEBS Letters. 1995; 374: 43-47. 36. Goodyear, LJ. Exercise, Glucose Transport, and Insulin Sensitivity. Annu Rev Med. 1998; 49: 235-261. 37. Olson NC et al. Circulating levels of TNF-α are associated with impaired glucose tolerance, increased insulin resistance, and ethnicity: The insulin resistance atherosclerosis study. J Clin Endocrin Metab. 2012. 97(3):E1-9. 38. Bradley JR. TNF-mediated inflammatory disease. J Pathol. 2008; 214:149-160. 39. Cawthorn WP, Sethi JK. TNF-α and adipocyte biology. FEBS Lett. 2008; 582:117-131. 40. Moller DE. Potential role of TNF-α in the pathogenesis of insulin resistance and type 2 diabetes. Trends Endocrinol Metab. 2000; 11:212-217. 41. Hotamisligil GS, Arner P, Caro JF, Atkinson RL, Spiegelman BM. Increased adipose tissue expression of tumor necrosis factor-α in human obesity and insulin resistance. J Clin Invest. 1995; 95:2409-2415. 42. Van der Poll T, Romijn JA, Endert E, Borm JJ, Buller HR, Sauerwein HP. Tumor necrosis factor mimics the metabolic response to acute infection in healthy humans. Am J Physiol. 1991; 261:E457-E465. 43. Hotamisligil GS, Shargill NS, Spiegelman BM. Adipose expression of tumor necrosis factor-α: Direct tole in obesity-linked insulin resistance. Science. 1993; 259:87-91. 44. Kern PA, Saghizadeh M, Ong JM, Bosch RJ, Deem R, Simsolo RB. The expression of tumor necrosis factor in human adipose tissue: Regulation by obesity, weight loss, and relationship to lipoprotein lipase. J Clin Invest. 1995; 95:2111-2119. 45. Merriam-Webster. Apoptosis. 2012. http://www.merriam-webster.com/dictionary/apoptosis. 46. Definition of apoptosis. 2011. http://www.medterms.com/script/main/art.asp?articlekey=11287. 47. Saito K, Takahashi T, Yaginuma N, Iwama N. Islet morphometry in the diabetic pancreas of man. Tohoku Journal of Experimental Medicine. 1978; 125(2):185-197. 48. Saito K, Yaginuma N, Takahasi T. Differential volumetry of A, B, and D cells in the pancreatic islets of diabetic and nondiabetic subjects. Tohoku Journal of Experimental Medicine. 1979; 129(3):273-283. 49. Clark A, Wells CA, Buley AD, et al. Islet amyloid increased A-cells, reduced B-cells and exocrine fibrosis: Quantitative changes in the pancreas in type 2 diabetes. Diabetes Res. 1988; 9(4):151-159. 50. Butler AE, Janson J, Bonner-Wier S, Ritzel R, Rizza RA, Butler PC. Beta-cell function and increased beta-cell apoptosis in humans with type 2 diabetes. Diabetes. 2003; 52(1):102-110. 51. Orrenius S. Mitochondrial regulation of apoptotic cell death. Toxicology Letters. 2004; 149(1-3):19-23. 52. Kagan VE, Tyurin VA, Jiang J, et al. Cytochrome c acts as a cardiolipin oxygenase required for release of proapoptotic factors. Nature Chemical Biology. 2005; 1(4): 223-232. 53. Garrido C, Galluzzi L, Brunet M, Puig PE, Didelot C, Kroemer G. Mechanisms of cytochrome c release from mitochondria. Cell Death and Differentiation. 2006; 13(9):1423-1433. 54. Igney FH, Krammer PH. Death and anti-death: Tumor resistance to apoptosis. Nature Reviews Cancer. 2002;2(4):277-288. 55. Lutter M, Fang M, Luo X, Nishjima M, Xie XS, Wang X. Cardiolipin provides specificity for targeting of tBid to mitochondria. Nature Cell Biology. 2000.; 2(10):754-756. 56. Han X, Yang J, Cheng H, Yang K, Abendschein DR, Gross RW. Shotgun lipidomics identifies cardiolipin depletion in diabetic myocardium linking altered substrate utilization with mitochondrial dysfunction. Biochemistry. 2005; 44(50):16684-16694. 57. Han X,Yan J, Yang K, Zhongdan Z, Abendschein DR, Gross RW. Alterations in myocardial cardiolipin content and composition occur at the very earliest stages of diabetes: A shotgun lipidomics study. Biochemistry. 2007; 46(21):6417-6428. 58. Steyn N, Mann J, Bennett P, Temple N, Zimmer p, Tuomilehto J, Lindstrom J, Louheranta A. Diet, nutrition and prevention of type 2 diabetes. Public Health Nutrition. 2004;7: 147-165. 59. American College of Sports Medicine. Exercise and type 2 diabetes: joint position statement. Medicine & Science in Sports & Exercise. 2010; 42: 2282-2303. 60. Lechleitner M. Oral antidiabetic drug therapy in type 2 diabetes mellitus – focus on elderly patients. Wien Med Wochenschr. 2011;11:297-299. 61. Saraf N, Sharma P, Mondal S, Garg V, Singh A. Role of PPARg2 transcription factor in thiazolidinedone-induced insulin sensitization. J Pharm Phamacol. 2012;64:161-71. 62. Avendonk M, Rutten G. Insulin therapy in type 2 diabetes: what is the evidence? Diabetes, Obesity and metabolism. 2009;11:415-432. 63. Ophardt, Charles. Glycolysis Summary. Available at: http://www.elmhurst.edu/~chm/vchembook/601glycolysissum.html. Accessed February 15, 2012. 64. Ophardt, Charles. Glycogenesis, Glycogenolysis, and Gluconeogenesis. Available at: http://www.elmhurst.edu/~chm/vchembook/604glycogenesis.html. Accessed February 15, 2012. 65. Sturm, Noel. Glycogen Metabolism. Available at: http://chemistry.gravitywaves.com/CHE452/04_Glycogen.htm. Accessed February 15, 2012. 66. Frojdo S, Vidal H, and Pirola L. Alterations of insulin signaling in type 2 diabetes: A review of the current evidence from humans. Biochimica et Biophysica Acta. 2009; 83-92. 67. Moffat C, Harper M. Metabolic functions of AMPK: Aspects of structure and of natural mutations in the regulatory gamma subunits. IUBMB Life. 2010;62(10):2/10/12-739-745. 68. Pickup J. Inflammation and activated innate immunity in the pathogenesis of type 2 diabetes. Diabetes Care. 2006;27:813-823. 69. Fernández-Real j, Pickup J. Innate immunity, insulin resistance and type 2 diabetes. Diabetologia. 2012; 55:273–278. 70. Rane MJ, et al. Interplay between Akt and p38 MAPK pathways in the regulation of renal tubular cell apoptosis associated with diabetic nephropathy. Am J Physiol Renal Physiol. 2009; 298: F49-F61. I think the pictures on this page might have distracted from some of the reading material. Nice work! You did a really good job on the cellular dysfunction section, however, you may want to change the * to a subheading. Some other suggestions I have are to move the Causes and Clincal Manifestations sections to the top of the page, condense the info in the normal cellular function section so it is less spread out, and title/label all of your figures. Good work! I think it looks great so far. Just a few things to consider: I suggest either using Type2 diabetes or Type II diabetes throughout the entire page. It jumps back and forth through out, I think it may just look more consistent with one or the other. With the images, a label/explanation of the image would help the reader understand the purpose/goal of the image. 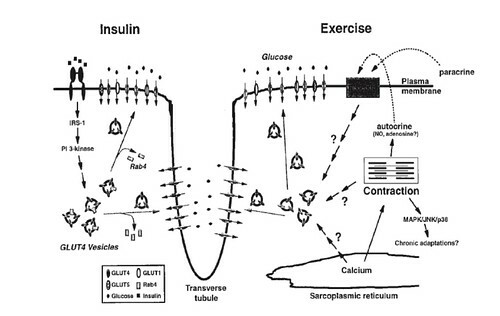 Also, I think the image with insulin and exercise is great and you should make sure to utilize in your exercise page. The layout looks good!! I would suggest labeling the figures. The section on apoptosis and mitochondria is very clear and concise. I also think the figure under PGC1-alpha could be a little smaller. We had trouble with that on the SCI page and used a syntax on several of the pictures to downsize or make them larger. Otherwise, I think it looks good and is very informative for the intended readers. 1. I agree with KB and Shannon - some figure numbers and labels would help. 2. Your Table 1 seems more like a list so maybe just bullet that information? 3. Table 2 would look prettier if you used the table wizard to make the first row a header row so it would be bolded and have a shaded background. 4. I think the Medical Management section could use some sort of numbering or bulleting help for aesthetic organization. Great comments guys! We are in the process of putting headings and figure/table lables above and small summaries below each of the graphs and images for a more coherent page. Please let us know if you have any other constructive advice. Thanks! I think this page is very easy to read. A couple comments though. I think you have an abrupt shift from the intro to hemoglobin. It felt like it came out of nowhere as a reader. I think it would be good to have a couple sentences setting up the rest of your page as kind of a road map and to summarize implications more fully as you go along. Also, I think that you need an overall conclusion section at the end. Thanks for the comments Cara. We will add an overall conclusion and re-arrange the hemoglobin section. We (the RA group) should talk to you guys. I ran across a paper that discussed depolarization of mitochondria due to oxidative stress from ROS. The stress was caused by relying excessively on fat as a substrate, which they said in the paper was caused by insulin resistance. The ROS triggered the the intrinsic pathway of apoptosis, then a bunch of really cool stuff happens. Contact me and I will send it to you. This page reads really well! Thanks Lisa! We'll definitely look into adding a compromised immune system section and changing some of our headings!